Google’s release of its new Pixel 3 phone, combined with a number of forthcoming digital devices, puts the tech giant on a physical product offensive. With the holiday shopping season looming, Google opened two popup stores giving visitors a chance to try out the latest models and see some not-yet-released gear. 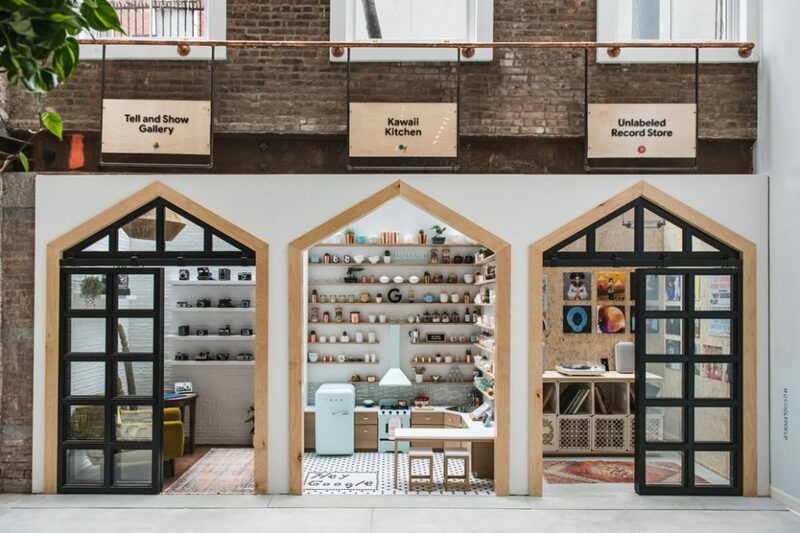 PSFK visited the SoHo location in New York City (there’s also a sister store in Chicago). Though unreleased products couldn’t be photographed, the store cut an impressive figure at the press preview ahead of its official opening. The SoHo store is just around the corner from Apple’s oldest retail locations in NYC. 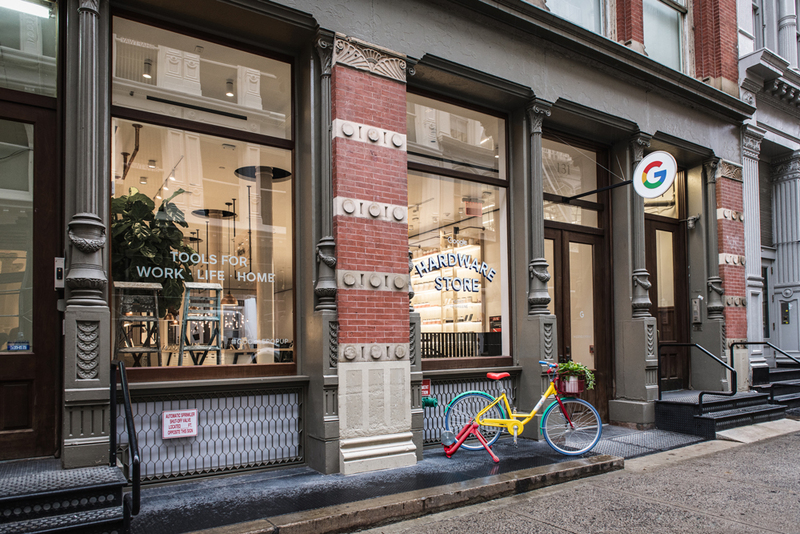 Since the focus of Google’s retail popup is hardware, it’s called the Google Hardware Store. Half of the interior is themed around an old-fashioned hardware store, complete with stacks of lumber and a wall of paint cans. The idea behind the space is to reference the old hardware stores as a place to go for problem solving. Google’s use of the theme tries to offer more options for learning opportunities. The first impression of the interior is that the quality of the finishes and fixtures is very refined. On the left are tables and wall shelves that display the products grouped by category (phones, tablets, etc.) The right side wall is floor-to-ceiling shelving stocked with paint cans. The cans aren’t just decorative, however: color labels represent case finish options available. While there’s a fair range of demo products on display in the front of the store, Google anticipated there might be an issue with crowding around the tables, so personal demo boxes are available as an alternative to 360 merchandising a la Apple. The small boxes contain a demo device and an illustrated booklet explaining the features. The idea behind them is people can check them out and find a place to sit in the store and demo the product at their leisure. Beyond the product portion of the space is a series of experiences unrelated to the hardware store theme. There’s a tree house, a mini record store, a tiny kitchen and a swing to test out taking the perfect shot using the AI feature on the Pixel 3. All of these are geared towards content creation for social media sharing. There’s also a free station for gift wrapping of products purchased at the store. The hardware store and experiential area together create an interesting aesthetic tension. While the interior space is sizable, spreading over two floors, each of the areas still feels intimate. Though not necessarily groundbreaking in terms of retail design, the Google Hardware Store plays up nostalgia, one strategy for pop-up locations targeting the holiday shopping customer.